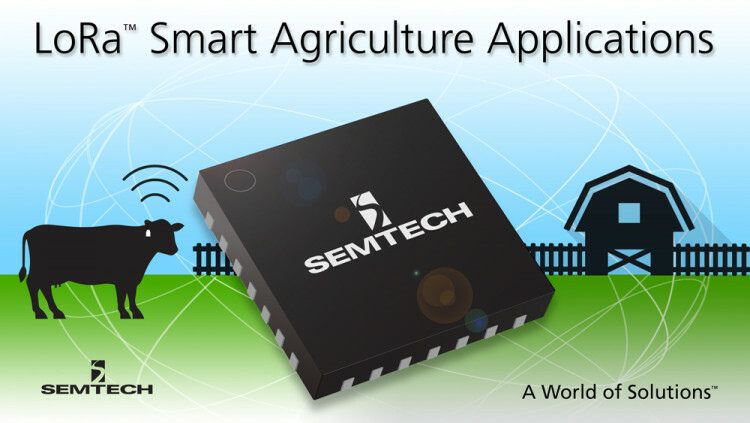 Semtech Corporation (Nasdaq: SMTC), a leading supplier of analog and mixed-signal semiconductors, today announced that after extensive testing its Internet of Things (IoT) LoRa™ wireless RF technology has been selected by Quantified Ag to help improve the welfare and productivity of feedlot cattle through the ingenious use of a connected health tracker that attaches as an ear tag on the cattle. The tracker was designed, implemented and tested by Communication Systems Solutions (CSS), a design house and systems integrator specializing in long range communication technologies. The tracker is part of a complete health monitoring system for livestock in which sensors in each ear tag constantly monitor livestock temperature, movement and other vital signs. The information from the ear tracker is relayed to a receiver, which sends data to a central system in the cloud where it is processed. Then, the information is sent back to the feedlot or ranch for viewing on a dashboard that is accessible via smartphones, tablets, email, SMS or secure website. According to Quantified Ag CEO Vishal Singh, the method currently used to identify sick cattle is visual observation. For example, if a worker finds a sick animal, it is pulled from its pen and checked. The problem with this approach is that many animals typically do not openly display their symptoms so humans are not able to notice them until they are very ill.
Another consideration in developing the monitoring system was range, scalability and battery life. According to CSS, which helped conduct the testing of Quantified Ag’s system, the LoRa-based solution provides the range and reduced interference needed to track thousands of animals with one gateway, making the system easy to install and cost effective. It also provides a long battery life to ensure the ear trackers last for the duration the animals reside at the feedlot. Get more information on LoRa Wireless RF sensors and gateways. For quarterly product updates, sign up for Semtech’s e-newsletter Inside Circuit. Find Semtech on Twitter, Facebook, LinkedIn and Google+. Quantified AG takes the guesswork out of animal health by providing a better solution for cattle producers and feedlot operators. Their solutions provide faster sorting and treatment of animals, which helps stop the spread of disease. The results lead to saving money, time, and animal life. For more information visit: www.quantifiedag.com. All statements contained herein that are not statements of historical fact, including statements that use the words “help,” “provides,” “likely to,” ”planning to,” “can” and “ideally” or other similar words or expressions, that describe Semtech Corporation’s or its management’s future plans, objectives or goals are “forward-looking statements” and are made pursuant to the Safe-Harbor provisions of the Private Securities Litigation Reform Act of 1995, as amended. Such forward-looking statements involve known and unknown risks, uncertainties and other factors that could cause the actual results of Semtech Corporation to be materially different from the historical results and/or from any future results or outcomes expressed or implied by such forward-looking statements. Such factors are further addressed in Semtech Corporation’s annual and quarterly reports, and in other documents or reports, filed with the Securities and Exchange Commission (www.sec.gov) including, without limitation, information under the captions “Management's Discussion and Analysis of Financial Condition and Results of Operations” and “Risk Factors”. Semtech Corporation assumes no obligation to update any forward-looking statements in order to reflect events or circumstances that may arise after the date of this release, except as required by law. Semtech, the Semtech logo, LoRa and LoRaWAN are registered trademarks or service marks, or trademarks or service marks, of Semtech Corporation and/or its affiliates. Third-party trademarks or service marks mentioned herein are the property of their respective owners.